In front of the cathedral in Vilnius, the capital of Lithuania, is a statue of its founder, the Grand Duke Gediminas. Carved in the plinth that supports his towering figure is a howling wolf. This recalls the dream that led directly to the foundation of Vilnius. In a military camp on a hill, Gediminas dreamed of an iron wolf that opened its jaws and howled. For guidance on the meaning of his dream, he sought out a shaman-priest named Lizdeika. According to tradition, Lizdeika was born in an eagle's nest on a conical hill at Kernave. Lizdeika lived closed to wolves, and was reputed to be able to shapeshift into their form. When the grand duke dreamed of the iron wolf, Lizdeika was recognized in Lithuania as the krivu krivaitis, or high priest of the old religion. Lizdeika told the grand duke he should build a fortified city on the hill where he had been sleeping. Vilnius is a city founded on a dream, and over the past week it was a grand place to be dreaming with a spirited circle of Lithuanians. She is Pele, as I drew her in my journal after a group journey through the chakras I led during my recent Hawaii retreat. While drumming for the circle, I found Pele giving birth to the islands while her fiery body streamed and coiled. I am forever drawing in my journal, the one I write in by hand. The boy artist in me enjoys this activity, and it makes the pages fun to examine when I get round to reading the records I have made. Sometimes the drawings are keys that help me to decipher the befuddling shorthand and hieratic scratches of my impossible handwriting. Often a series of little sketches look like the funny pages, or even part of a graphic novel. I might depict several acts of a dream or shamanic journey in panels, or on successive pages. 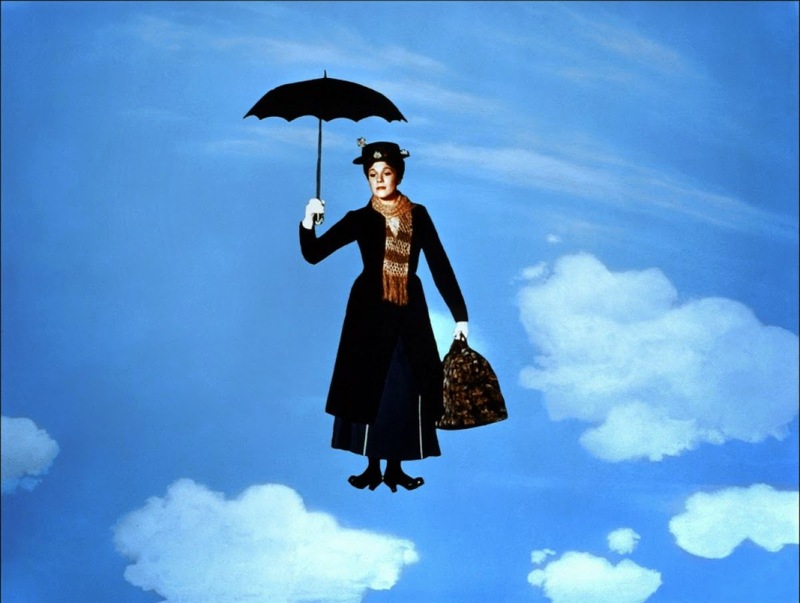 I am getting to know the author of Mary Poppins. The life of P.L. Travers (the name she chose) was full of shadows and sharp angles that are missing from the delightful Disney movie (though not from all of the Mary Poppins stories she wrote) and of adventures in several worlds. She was an intimate of AE (George Russell), the Irish mystic, a friend of Yeats and Gurdjieff, and no stranger to the rituals of the Golden Dawn, the practices of yogis, and the vision quests of the Plains Indians. She was fascinated by the idea of the double, and came to believe she was leading a double or treble life, in parallel realities. My current reading includes an excellent recent biography of by Valerie Lawson, published in the United States as Mary Poppins, She Wrote. This contains many surprises. As a young girl in Australia, young Helen Lyndon Goff (as she then was) so longed to be "away" that she approached a gypsy camp near her home and offered a tall blue-robed man one of her sandals, hoping he would whisk her off into another world. The stranger gravely inspected the sandal, and returned it to her, leaving "Lyndon" to make her own way. She disliked her native country, and was stirred by stories of Ireland and England, where she traveled as soon as she was able. I have also been looking again at a late collection of essays by P.L.Travers, titled What the Bee Knows, that is probably her least-known work. It turned up, placed eccentrically on an unlikely shelf in a used bookshop, through the helpful machinations of a shelf elf. Opening the book at random, I found a beautiful essay “On Forgiving Oneself” that is a marvelous evocation of encountering a Greater Self that proves to be no stranger. I would title it “Meeting the Blue Lady”. Then she thrust a hand under her veil and drew it down from head to shoulder, her face emerging from the blue as the moon slips out from the edge of a cloud. It was my face...And I knew that I had always known, and at the same time refused to know, what lay between the veil. "You must know the heart of hatred to gain the salvation of love"
I find myself in front of a pair of massive carved oak doors with lion knockers and fleurs de lys. Inside I meet Charles d’Orléans, the poet-prince in whose name Joan of Arc went to war. I have dreamed into his life over many years, but this is the first time I have seen him face to face. I observe him closely, recalling that no contemporary portraits of him survive. Charles has sharp, angular features, a beak of a nose, a strong pointed chin, dark straight hair cut above the shoulders. He is in what, for him, is informal garb: a particolored doublet (dark green and pale green or cream) and hose. He declares in French, Il faut connaitre le coeur de haine pour obtenir le salut d’amour. "We must know the heart of hatred to gain the salvation of love." The words strike deep. 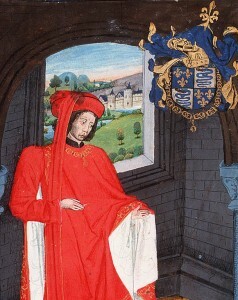 I ask the 15th century Duke of Orleans why I have been dreaming into his life, and his death. He tells me: Je porte le sceau des ages, inclus de l’age mussulmane que vous importe si lourde dans vos temps. "I carry the seal of the ages, including that of the Muslim age that weighs so heavy on you in your times." This is exciting, and altogether mysterious. Il faut connaitre le coeur de haine pour obtenir le salut d’amour. We must know the heart of hatred to gain the salvation of love. "My mother schooled me in hatred. Chief among her keepsakes, in the black-shrouded box near my right hand on the table, is the silken square on which she first embroidered the emblem of our family’s grief, and hate. It is the image of a rounded watering-can, a chantepleure, dripping fat drops of blood. My mother told me it was her heart that was bleeding, and would go on bleeding until we avenged ourselves on John of Burgundy, who had my father chopped to pieces on a Paris street like a side of beef on a butcher’s block. "John is long dead, and I cannot hate him now. His son became my friend. On the game-board of this world, the pieces are forever in motion. "My beautiful young wife Marie is waiting for me. Perhaps she is my reward for the bloody years of war and revenge, and the longer years I spent in a gilded cage, as a hostage in England. I am writing a new poem for her, or rather for the Lady of the Forest of Long Awaiting I worship in the pleasing slopes of her body. "Through the landscapes of women, and of the gentle Loire country around my chateau of Blois, I give myself reason to stay in this body, which has survived longer than any of my boyhood friends, but is beginning to fail. The Lord knows – and the Adversary even better – that I have had no difficulty leaving this body. I am a prince of France, but I am also my mother’s son. "There is a rustle of wings at my window, and a huge black crow tapping at the glass. The sheen on its plumage is purple in the morning light. Is it my mother’s familiar, calling me to yet one more act of family duty – or vendetta? "I am writing in my library, here at Blois, the city I love best. Through the leaded glass, I see the lazy bend of the Loire, lemon-green in the sunshot mist. At my left hand, I have my copy of the Picatrix, lettered by a renegade monk from Germany. I never tire of reading its account of a city of magicians in North Africa. Next to the Picatrix is the jeweled box that contains the rarest of all my manuscripts. I have had five letters of Greek embossed on the lid. Θαύμα. Thauma. The contents of this box have made a long journey. By a great irony, the script was in Constantinople at the same time my family’s enemy, John of Burgundy, was there as a prisoner of the Great Turk…"
Graphic: Dutch artist's version of Charles d'Orleans, circa 1471. There are no surviving contemporary portraits. I met a dubious character in my dream wanderings last night. I saw him first as a vigorous 40-ish man with wild dark hair and beard, wearing a long, loose coat or robe of many colors. At his third eye, he wore a tattoo of a sunburst. It was inked in flashing colors, giving the impression of solar flares. He also clearly meant to indicate to those he was trying to impress that his third eye was open, and capable of projecting immense psychic power. His energy was that of a sorcerer; his style that of a huckster. I watched him in a marketplace, up on a little platform, seeking to win followers with his tricks. I gave him a wide berth. But later in the dream, after traveling far and wide, I met him again. I did not recognize him to begin with, standing near an arch in an old brick building that might have been St James's Palace in London. He was now an old man, very tired and pale, his skin almost white, dressed in a three-piece black suit. His hair was close-cropped, curly and white, his lips almost colorless. I would not have known him except for the sunburst tattoo. It was now leached of color, its lines puckered like the edges of an old wound. He stared at me intently, and I remembered a figure in a dream of long ago - a leader of a British esoteric order - who had sought to impress me by opening a third eye, quite realistically, in a gathering of his acolytes. Would the old man with the faded sunburst tattoo try a similar stunt? Apparently not. We took each other's measure for a long moment, then I moved on. Dreaming is traveling. We get around, we visit various neighborhoods in a geography much vaster than that of the physical world, we meet other people. I could play psychology games with this dream - for example, by asking "what part of me" is like the man with the sunburst tattoo, in his two versions and his aging - and they could be interesting, up to a point. But I know, as a lifelong dream traveler, that he is not merely an aspect of myself; he is a transpersonal figure, living another story that occasionally (it seems) intersects with my own. I don't feel inclined to follow his trail, but I'll be on the lookout for his possible further appearances in my night life. I haven't got his number yet, but I know his mark. the gleam of rain on a chinaberry tree. In last night's dreams: I am at a table where we are swapping stories. When it is a person's turn to tell or read a story, a colored disk floats in the air behind and just above his or her head, flashing a complementary color. It is my turn. There is a red disk behind me, flashing light turquoise. I take the seat at the head of the table. I am very happy that I have a 5-page finished typescript I had long forgotten I had written, about past life issues that surface in the lives of a contemporary couple. Waking, I recall magical exercises for training vision that involve using a Westernized version of the tattvas and their complementary or flashing colors. The red of the disk and its placement remind me of the symbol of the Egyptian goddess Hathor, who wears a red disk between horns, when depicted as a woman or a cow. We often play story-swapping games in my workshops, especially "Writing as a State of Conscious Dreaming", which I led last month as a 5-day retreat at Mosswood Hollow and will lead again next year. I am engaged in gathering and editing stories I have written over many years for a new collection, and am intrigued by my dream discovery that I have one "ready to go" on a theme Dion Fortune took up (as discussed here yesterday) 90 years ago. Dr Taverner is guided by dreams and coincidence in his work with an airman named Arnold Black, who spends his nights driving around the country at crazy speed, feeling that he is on his way to an encounter with a woman he loves but has yet to meet. In his first session with the wild driver, Taverner says, "If chance brought you to me, you are probably in my line." In his effort to solve the mystery of what is driving Black, Taverner asks him about his dreams, and finds that they glow with an "oriental light." He is inspired to show the airman paintings of Egypt, and Black recognizes scenes from his dreams in the ancient images. Taverner is encouraged to follow one of his basic procedures. When confronted with behaviors and mental states that have no adequate cause in the current life of the subject, he probes for a possible past life context, "getting the record of the previous lives of his patient by those secret means of which he was master." Black was in a recent airplane crash. Dr Taverner concludes that the trauma "had the effect of hypnotizing him, and he got into that particular part of his memory where the pictures of previous lives are stored." The woman Black is seeking may have shared a past life with him in ancient Egypt. The question now is whether she can be found - and what will happen if she is. The violent urgency of the airman's need to find his love from a previous life cannot be contained. He is in imminent danger of killing himself on the road if nothing can be done. "These attractions that come from the past," Taverner observes, referring here to past lives, "know no barriers. Black would drive that car through the Ten Commandments and the British Constitution to get at her. He will go till he drops." Coincidence comes into play again. A listless young woman is brought to see Taverner in his consulting rooms in London. He prescribes rest at his nursing home in the country, where she encounters a ghost of the living: the etheric body of the man who has been seeking her. Black is discovered in a car wreck close to the nursing home. The extrusion of his etheric double has left him close to death; so much of his vital energy has left his body. Taverner saves Black by leading the girl into the emergency room. At this point, the airman's etheric body rejoins the physical one. As the girl stays with him, holding his hands, he begins to revive. He eventually recovers, and the lovers who knew each other in Egypt are able to marry, reunited in their current lives. This is a summary of a story titled "The Man Who Sought", in Dion Fortune's collection The Secrets of Dr Taverner. It raises many interesting questions. I have no doubt that our current dramas and relationships are connected to stories that played out - and may still be playing out - in the life experiences of personalities in other times. What triggers memories of those other lives, other than something like the airman's trauma? How do we balance, and help others to balance, the legacy of a past life with the needs and obligations of the present one? Can karma and past-life connections be mediated a different way, perhaps by taking all of this up to the level of a Greater Self? How can we be sure that the past life is truly that of a contemporary individual, as opposed to the obsessive memory of an obsessing entity? I shall leave these questions hanging for now, though they are central to my own work and are addressed, in part, in my book Dreamgates. I am content, for now, to continue describing the practice of Dr Taverner, modeled by Dion Fortune on her early mentor, the mysterious Anglo-Irish mage, Theodore Moriarty. Dion Fortune says that she told the story titled "Blood-Lust" (in The Secrets of Dr Taverner) exactly as it was played out in physical and psychic reality. Captain Craigie, back from war, starts killing for blood. He starts by raiding chicken coops and works his way up to sheep. Along the way, he can't help trying to sink his teeth into his fiancee's neck. He tells Dr Taverner, the unusual practitioner who turns his attention to the case, that he suffered "shell-shock" in the trenches. This was a familiar term in the World War I era; today we are more likely to speak of PTSD (post-traumatic stress disorder). But in this case, "shell-shock" seems an exact description. Captain Craigie was blown out of a trench. The source of the problem becomes literally visible when people start seeing the apparition of a German soldier in a flat cap and field-gray uniform. This, we learn, is the etheric or dense energy body of a dead enemy soldier who has attached himself to the unfortunate Craigie, seeking to feed his "vitality hunger" (as Taverner diagnoses his condition) through his living host. Dr Taverner's solution involves baiting a trap, by nicking the neck of the captain's girlfriend. While Craigie is physically restrained, the hungry ghost of the German soldier leaves his body to seek the fresh blood. Taverner stands between the ghost and its host and forces it into "a psychic killing-pen" in the form of a triangle. Dr Taverner pronounces that the source of the problem was "a corpse who was insufficiently dead." While some parts of the plot summary may sound like the script for one of those old Hammer horror flicks, the story touches on themes of perennial importance, including the plight of veterans of foreign wars yesterday, today and tomorrow, who may be carrying unwanted energies of the dead. We have two physical bodies...the dense material one...and the subtle etheric one, which inhabits it, and acts as the medium of the life forces, whose functioning would explain a great deal if science would only condescend to investigate it. By my observation, this is exactly correct. Failure to understand the nature of the etheric body and its survival of physical death confuses our relations with the dead and delays or prevents recognition of the need for spiritual cleansing and releasing in healing cases of PTSD, addiction and other disorders. Dr Taverner instructs that "it is possible to keep the etheric body together almost indefinitely if a supply of vitality is available". In "Blood-Lust", the supply of vital energy comes through "a human feeding bottle" that feeds on others in an effort to replenish itself. How common is the problem? Well, literal vampirism and blood-drinking may be rare (despite the contemporary vampire fad) but energy vampirism has never been uncommon, alas. Dr Taverner, the magician, alludes to dark side magical practices by those who seek to avoid the second death (of the etheric body) by forming "a connection with the subconscious mind of some other soul that still has a body." He cautions that "the lower type of medium" is especially vulnerable to this type of parasitism. But "higher" types can be vulnerable if in a weakened or absent condition, as when Captain Craigie was blown out of his trench, and (for a period) out of his body. Who ya gonna call, if you don't have a Dr Taverner down the street? Well, I give rather specific guidance on spiritual release, including staging a "second burial" for an etheric body that does not belong with the living, in The Dreamer's Book of the Dead. And we have Dion Fortune's classic Psychic Self-Defence. In his nursing home, Dr. Taverner reaches the parts that physicians and psychiatrists cannot reach. A shaman in country tweeds and a psychic Sherlock Holmes, Taverner deals with complaints that result from psychic attack, soul theft, energy vampires and diseases of the group mind. His creator, Dion Fortune (born Violet Firth) knew her stuff. The founder of her own esoteric school, which came to be known as the Society of the Inner Light, Dion Fortune (1890-1946) modeled the hero of the stories collected in The Secrets of Dr Taverner on one of her own early mentors, an extraordinary Anglo-Irish magus named Theodore Moriarty. Some of the stories were first published in the Royal Magazine in 1922, a year before Moriarty's death. Remarkably, the illustrator made the fictional Dr Taverner look very much like Moriarty, though the artist had never seen a picture of Moriarty or even heard a description. Jelkes, the bookseller in Dion Fortune's novel The Goat-Foot God, says that "writers will put things into a novel that they daren't put in sober prose." Dion herself said that while books of hers like The Mystical Qabalah give the theory of high magic and spiritual reality, "the novels give the practice." There are five of those novels, and some of them have left a profound mark on esoteric and neo-pagan practice. The Sea Priestess contains a ritual for Drawing Down the Moon that has been much-borrowed in ceremonial work, not always with attribution. But of all her fiction, it is the stories of Dr Taverner to which I return again and again. I have asked some of my advanced classes to read several of these stories as the basis for focused discussion and investigation of such phenomena as the nature of the energy bodies, past-life connections, psychic defense and astral repercussion. Fortune is rather direct about what she is doing in The Secrets of Dr Taverner. She describes her tales as "studies in little-known aspects of psychology put in the form of fiction because, if published as a serious contribution to science, they would have no chance of a hearing." She wants it understood that her stories are based on fact. Her characters are mostly composites, but they are based on actual people and situations. She states that the first of the stories she completed, the tale of a hungry ghost attached to a living person that she titled "Blood-Lust", is "literally true". Noting that she was one of the first British students of psychoanalysis, she expressed the hope that the Taverner stories would be received as "a serious study in the psychology of ultra-consciousness." In my opinion, she succeeded beyond her ambition. The Taverner stories are both gripping and entertaining, and a valuable source of practical guidance on psychic protection and spiritual cleansing and many other facets of psychic well-being that are missed in our standard approach to healthcare and therapy. In its fictional wrapping, The Secrets of Dr Taverner is a practitioner's casebook, of the greatest value to subsequent practitioners. It is perhaps the most accessible of all Dion Fortune's works for the contemporary reader. Her narrator is a medical doctor named Rhodes, a supposed ingénu in regard to psychic phenomena and esoteric techniques. This makes it easy for Fortune to draw the veil over certain procedures. But enough shows through to make the story collection a kind of manual, especially when read together with Fortune's well-known later (nonfiction) work Psychic Self-Defence. In further articles, I'll discuss individual stories and the lessons to be drawn from them. "You've got to name me"
I am leading a workshop for a huge number of people, gathered in many rooms and on several levels of a spacious building. The central space has a domed ceiling with a skylight. I call everyone to come as close to me as possible, under the dome. I teach them the Lightning Dreamwork process and have them choose partners to do dream sharing together. Next I select some experiences that are teaching examples of how healing can come through dreamwork. One of those I choose to share a personal experience with the whole group is a man I call Father David. When I look at him, I can see him standing by a fountain in Rome. He came to my workshop with some misgivings, but he is going through a deep transformation. He is not only willing to talk to the group; he is ready to sing. His voice rises in the cadence of a spiritual. The chorus of his song is "You've got to name me." I wake from my dream, thrilled with excitement, with the music and that one line pulsing inside me. "You've got to name me." Sometimes a single phrase is all we need from a dream, especially when it comes on the wings of song. This "old" dream, which I found in a 2002 journal just now, has lived with me ever since. Though the details of the dream report had faded (until now), the message has not. There is such power in naming. When it comes to our health and healing, we require the correct names for conditions and symptoms. We also want to claim the ability to re-name what ails us in ways that can help our bodies and our hearts to heal. In Madeleine L'Engle's luminous novel A Wind at the Door, the villainous Echtroi, or ancient enemies, are the Un-Namers who kill by Xing things out. "You've got to name me." Coming in a spiritual, from a man who may be a priest, this also carries the message that we want to remember that we can call on a saving power, by a name we believe in. If in doubt, call on Love and Light, and Forgiveness. Those are saving names. - inspired by an invocation of Hermes in Papyri Graecae Magicae (Greek Magical Papyri) translated by Hans Dieter Betz, XVIIIb: 1-23. Hegetor oneiron ("ruler (or leader) of dreams") is a praise name in the Homeric Hymn to Hermes. Robert Louis Stevenson thanked his "Brownies" for some of his best creative work. 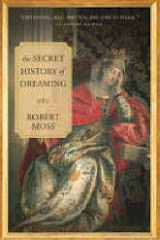 He described them as laboring away on his stories when he was asleep or in half-dream states, so that better than half his work was done when he came to put pen to paper. 1. I examine a typescript I've been working on. I have left gaps in the narrative. Someone has filled in these gaps and inserted some further material. I can see at a glance where the new material is, because it looks like it has been highlighted in yellow, though the highlighting effect fades as I read it. I am at first annoyed that someone unknown has been fooling around with my text, and assume that the inserts are random. But when I study the new passages more closely, I see that they are just right. The penultimate paragraph is beautifully expressed. I try to figure out who has been working on my text. In the distance, I see a beautiful woman in a yellow robe. 2. With a woman companion, I have been encouraging an older man to take up art. We have expressed enthusiasm over some colored drawings he has done, and are looking at a folder of these. Most are incomplete, and they are not especially well executed when we look at them more carefully. There is a spill; I think it is my companion who spills water or tea over some of the drawings. This makes the colors run and the effect is quite magical. I am excited that an accident has brought the drawings to life. I stirred from these dreams in a state of excitement and delight. Reality check: I am currently writing a story and have left gaps in the text. I draw a good deal, often with colors, but my technical execution could do with improvement. Action plan: I'll fill in the gaps in my narrative, and let the colors run - by using oil crayons and perhaps watercolors - in some of my new artwork. And for the Little People, what shall I say they are but just my Brownies, God bless them! who do one-half my work for me while I am fast asleep, and in all human likelihood, do the rest for me as well, when I am wide awake and fondly suppose I do it for myself. That part which is done while I am sleeping is the Brownies' part beyond contention; but that which is done when I am up and about is by no means necessarily mine, since all goes to show the Brownies have a hand in it even then. opposes my passage. No way around. seeking his master. Where's the boss? Yama, we know each other. of a cowboy swinging a lasso. look like a child's stuffed toy? the devouring eyes, avid to drink breath of the living. I have come here to purchase a life.